The second day of IMPA London saw sustainability frontrunners and interested professionals gather at the IMPA ACT Forum to find out more about the state-of-the-art management system. A great turn out and active audience at the IMPA ACT Forum on the 2nd day of IMPA London clearly indicated that the shipping industry is ready to take the lead in supply chain sustainability. Missed the Forum? This is a full transcript of the session. 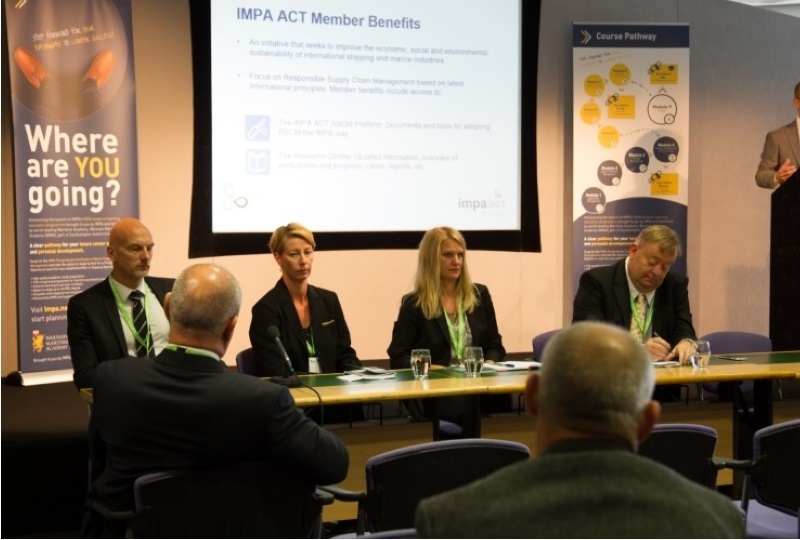 A year on from the launch of IMPA ACT, IMPA assembled a panel of the founding members of IMPA ACT, together with users and members to discuss and debate the practicalities of adopting RSCM in shipping. The forum was facilitated by Stephen Alexander, IMPA Chief Operating Officer and General Secretary, and Tatiana Stotz, IMPA ACT Programme Manager. ‍STEPHEN ALEXANDER: Yesterday, Carl Jansma, VP for Procurement at Wilhelmsen Ship Management, gave a thought-provoking presentation on the changing role of procurement in our industry. He explained how the role of procurement had changed under the direction of senior management. I was excited by this demonstration and how Carl had indicated that procurement has an increasingly important role in shipowners and managers’ organisations. This includes increased transparency, accountability, sustainability, supplier-relationship management and responsible supply chain management. Carl’s presentation really hit home the role that IMPA is working hard to play in the industry. IMPA’s role is to support the function of maritime supply chain management with shared knowledge, information, resources and tools to progress excellence in the sector. IMPA ACT does exactly this in the field of RSCM. Incidentally, yesterday IMPA launched a new education pathway for ship management in procurement with its new distance-learning programme brought by IMPA and the WMA. Carl talked of the importance of supplier relationship managementalongside sustainability and RSCM practice, and both subjects are covered extensively in the first steps of this education pathway. That is the postgraduate certificate in supply chain management. This programme was brought forward fora number of reasons, but increasingly senior management are looking into their core values and at their company’s operations and realising that sustainability is a central theme in their business. Our programme exists for buyers and suppliers in the industry; it seeks to improve the economic, social and environmental sustainability of shipping businesses – that’s the essence of CSR. Our programme on RSCM is based on the latest international principles –that’s important because RSCM has been around for a number of years. What we have now, with the emergence of UNGPs in 2011, is a very clear framework for the minimum expectations companies should have in place for their business. So what you have with IMPA ACT is the very latest and up-to-date programme, meeting those expectations universally. Question 1: I want to ask the panel what attracted their company to sustainability and working with RSCM. What was it that started you off on your sustainability journey? OLE LYKKE: For NORDEN, it was our senior management signing the UN Global Compact three years ago. It was a natural step to further with RSCM. We were then in touch with Lauritzen and we discussed creating a common code of conduct. Following a lot of meetings and discussions, we contacted IMPA to ask if they could bring the idea to market as an industry standard. KATHRINE GEISLER-MADSEN: For J.Lauritzen, it was the same. Firstly, an internal demand from our senior management when they signed the 10 voluntary principles on responsible business conduct. That was the internal push that was needed. A different pushwas that in 2011 the UN adopted these guiding principles, and it was the first time at a political level that there was an engagement and agreement on the right way for businesses to work with their respect towards human rights. What happened in the UN was suddenly in the OECD guidelines, so we now we see it legislation in many places around the world and it’s coming into the annual reports as a demand. And when you have a demand in the annual report that issigned by CEO and board of directors they start asking what the company is doing about CSR in our supply chain. So it’s both a value commitment from top management and a demand from legislation. ‍KATJA FARVER: From a supplier perspective, Norden came to us asking us to adopt the policy. It was a prolonged process. We had already adopted the ISO9001 and were looking into the ISO14001. So it was really an augmentation of this, so it wasn’t a stretch to adopt RSCM policies. OLE LYKKE: It’s important to understand that this is not a commercial tool, it’s cooperation. We want to engage with our suppliers. If they say they’re not happy with RSCM because they can’t see the value or it’s too expensive, we try to help and to engage and come to a solution. TATIANA STOTZ: It seems that alignment with company values and the creation of valuesare important. It’s also something that is buildable – so you have existing processes in place but this is a way of having a structured framework for engaging in CSR and RSCM. Question 2: I want to ask the panel what attracted their company to sustainability and working with RSCM. What was it that started you off on your sustainability journey? STEPHEN ALEXANDER: IMPA ACT is an umbrella process, covering human rights in business, the social side of corporate social responsibility, environmental and anti-corruption. The programme IMPA ACT is covering this entire agenda. A lot of what you will be doing in your businesses right now gives a big tick to the IMPA ACT programme – ISO 14001 is a good example of that. It’s a good example actually, because for the IMPA ACT programme under the environmental area of the project, if you ISO 14001 you have a big tick in that side of the business.There are other areas too. KATJA FARVER: The IMPA ACT obliges you to go into deeper relationship with your sub contractors and distributors. So you enter into dialogue constantly – it’s an augmented umbrella. KATHRINE GEISLER-MADSEN: IMPA ACT is all the bottom lines. You have the people bottom line, the human rights bottom line - human and labour rights. And it’s actually mandatory for every company to identify and work with a management system to prevent and mitigate impacts on human rights. That’s one part. When you join the IMPA ACT and you can say you have ISO 14001 we are assured that you have a management system in place to manage your impact in relation to environment. So you can tick off a third of the programme in compliance. Question 3: There are concerns over cost from a buyer’s side engaging suppliers with this and the cost of implementation. For the buyers on the panel, how do you engage with your suppliers on this issue of cost? And from the suppliers, how does the cost of implementing CSR or RSCM becoming outweighed by the benefits of engaging in the process? STEPHEN ALEXANDER: There is no discount on the IMPA ACT if you have ISO14001 implemented because the IMPA ACT is not expensive. As you know, IMPA is a not for profit organisation, investing in putting initiatives to the market place. The actual cost of joining IMPA ACT is relatively little. If you’re a supplier that’s been partnered with an owner and are at the stage where you are not actually implementing RSCM within your supply chain, with your suppliers, you won’t join at the level of any investment. You’ll be on as an IMPA ACT partner. You’ll be able to have a modified profile on our database, which will be a modest cost. Of course, there is cost looking at your own management systems and looking at your own processes, but this programme has been designed to do that over a period of time and a lot of those processes – such as ISO 14001 – you’ll already have in place. This brings the full spectrum of profit, planet and people under one umbrella. In each one of the areas there may be some things that you are doing well, there may be some things you need to improve or hadn’t realised before because these new guiding principles have come in and they’re relatively new for a lot of people. Many of them you will be addressing. The partnership process with your customer, your owner or manager engages in those areas where there may be additional process, documentation policy process statement put into place. OLE LYKKE: One of the benefits is that you get a totally different cooperation with your supplier because you discuss and speak about soft issues. For example, I knew Katja before we started with the IMPA ACT, but now we have a different relationship and a different kind of partnership. Question 4: Down the line somewhere I think the supplier has toinitiate this, it’s not something that the buyer is impressing on the supplieralways. At some point a supplier is also a buyer of goods, buying from theirsub suppliers. Does it apply to their organisation? STEPHEN ALEXANDER: Indeed. And that’s the idea, that it trickles down and affects the complete supply chain. Question 5: As a supplier, what I have seen in my career is thata lot of suppliers who can give a good price, irrespective of what back up hehas, will always get the business. This happens all around the world. Myopinion is that in line with IMPA ACT point 6, suppliers ought to be auditedcorrectly. Today to join IMPA you fill in a form, pay your annual fees put thelogo on your collateral and you get the business. What is there behind you? Myrecommendation is let’s take this seriously, the cost must be reasonable. Weshow our seriousness, audit our suppliers and grade them. A purchaser can thenlook into that registration and see what the company is about. And that iswhere we can take the industry. We need to get to the fundamentals. STEPHEN ALEXANDER: Great point.This is a personal passion of mine, the audit process because I think there is a great opportunity for IMPA to extend this and what we hope to be announcing later this year is a supplier profile page, where suppliers are able to upload their information where buyers can have access to without having to duplicate effort.The code of conduct that has been mentioned a couple of time means thereis a standardised system – there are hundreds of codes out there. Auditing again should be working to the standard that will benefit the supplier. There are opportunities there with what you are saying. TATIANA STOTZ: From a supplier side we want to create a platform where suppliers that don’t cut corners and who are investing time in doing things properly – particularly in terms of environmental and social complianceand dealing with issues – are rewarded for their hard work and recognised for their effort. STEPHEN ALEXANDER: Supplier relationship management is one of the core modules of the IMPA’s new programme. Procurement is changing. There will always be customers who but on price, but increasingly companies are looking strategically in procurement. It’s a board room agenda now. It’s exciting for the procurement industry that this is now being raised on the board room agenda at a senior executive level. And that focus is about building long-term supplier relationships and that will have a positive impact on what you have said. Question 6: We’re starting out on this journey. What I want tohear from those of you that are ahead of us, what have been the biggest hurdleson this road? OLE LYKKE: From my part, it was all the expressions and the wordings from the UN Global Compact and Guidelines – what do they mean? I am not an academic. So what do all these things mean? It’s not rocket science; it’s actually quite simple, so if you just take it step by step it makes sense. I was very sceptical when we started this journey two years ago. I cannot save the world. But now I have seen thelight so to speak. KATJA FARVER: The important thing that you mentioned earlier was that it started out as a dialogue and it has continued to be a dialogue. HENRIK STEFFENSEN: We have had some internal difficulties, convincing the technical managers that they have to choose the suppliers that we pre-qualified through our supplier code of conduct. It’s a long struggle but we have succeeded in convincing them. KATHRINE GEISLER-MADSEN: You have to start somewhere and we are getting there in many areas and in some areas we are not there yet because we are ourselves establishing processes. And I think that is also what adds value with dialogue to the suppliers. They might have had best practise in some areas where we have best practise in others. So it’s actually where you learn and share in a different kind of way. We have had dialogue with a CSR supplier and a few weeks later they have responded tellingus that they have had a business review and found they know us better. So it has added value. Question 7: I would like to know howmany companies are complying with the IMPA ACT and what are your expectationsin the future? STEPHEN ALEXANDER: The programme was launched last year. We have nine ship-owners and managers signed up to the programme. KATHRINE GEISLER-MADSEN: We see more and more of our customers – the oil majors, the mining companies asking questions on due diligence and these areas. When I joined JL in 2011, the scope was pretty much about environment and health and safety. Now the due diligence we are being sent are much more extensive and they actually have the UNGPs. OLE LYKKE: My company Norden is a bulker and tanker owning company and we did a contract about a year ago with a big Norwegian mining company loading coal in a very delicate environment. It was a long-term contract and the company chose Norden becausewe have a CSR policy and a supply chain management system and a solid procedure if anything should happen. It can be used in a commercial way. KATHRINE GEISLER-MADSEN: For many companies it is risk management. HENRIK STEFFENSEN: When our customers demand that we have control of our sub-suppliers we will not be able to ask suppliers to work with us that do not comply with us in the future – that’s why it will pay off for the suppliers working seriously with the IMPA ACT. KATHRINE GEISLER-MADSEN: What is the expectation of compliance with the supplier code of conduct? It might sound a bit strange but we are not even in compliance with the code of conduct. That way it’s a much more honest paradigm. We know that this is the style we are working after, so it becomes much more about identifying your potential risk and actual risk in certain areas then focusing on that. Some might be areas you want to work specifically with your suppliers, because that is a shared risk. Other risks might be structural. Question 8: How do you define CSR? The activities in our company for instance are free access to drinking water, we provide free meals daily, school fees are paid to supervisors and also everyone has access to an interest-free loan from the company. The Government expects us to provide schools and health care. What kind of corporate social responsibility acts do you do in your company? Are they similar? Or are they in a global context? How will IMPA standardise that? KATHRINE GEISLER-MADSEN: That shows perfectly why we have to work with internationally adopted principles and the basic for the UNGPs on business and human rights takes into account the international bill on human rights. It gives it whole scope of human rights. From what you’re saying you’re working to right to food, right to water because these are areas that are embedded within your community. So that’s why they’re on top of your agenda. That is what this programme allowsfor. It allows for us to work with the areas that are most close to our heart within the cultural context. We have offices in Singapore and Shanghai and different parts of the world where the issues are different and that’s what this system allows for. That is why this programme takes into account the country risk. We are not saying because you are in Tanzania you might have more issues than in Denmark. They’re just different. Question 9: How can you put the price of that on your product? What is the value added with the standardization? OLE LYKKE: If your company is an approved IMPA ACT supplier, then you have an advantage compared to another ship supplier in Tanzania who isn't. If I have a ship coming to Tanzania I would choose you if you were an approved IMPA ACT supplier, because then we know that you are on top of the various issues and that you are responsible. KATHRINEGEISLER-MADSEN: So the IMPA ACT is actually a risk mitigation tool as well. Question 10: How much experience have you had in having to grapple with some of these more detailed questions about Human Rights? What do you do when you are faced with these close questions – is it or isn’t it within ILO standards to recognise a particular practice as being what we need to do? How do you deal with the problem of having to get a technical answer to a human rights question in this context? OLE LYKKE: The IMPA ACT is made and developed so that non-CSR people can work with and understand it –that is one of the beauties of the IMPA ACT. It’s not a specially made tool for people like Kathrine that are CSR-educated, it is for purchasers like me. You will get the training with the IMPA ACT through the toolbox and how to handle various issues. For example, if a supplier says we use child labour – how do you handle this? You will have an answer to help solve the issue. KATHRINE GEISLER-MADSEN: The UNGPs on business and human rights and the demands that are in this code of conduct as well as well is that you work with a policy statement. People that know their human rights should inform the policy statement; but you need to introduce the vocabulary in a proper way. I’ve been trained in four days courses in terms of knowing the human rights because it is knowing the substance of right number three: what is the right to work? If you are an employer you have a potential impact on the right to work. It might not be actual because you have a procedure. We found that we might have a potential impact on the right to security and liberty of a person, the right to not be subjected to torture - as a ship owner we sail through the Gulf of Aden. Each time we put our ships through there we have a potential risk of them being attacked by pirates. So what do we do? We have this potential negative impact – so it’s about what we do. We use the BMP guidelines to put guards on board to prevent and mitigate our risks. So it’s about creating a language that is familiar to the people in this industry because we are used to working with various rights - we have the language it’s just a case of tweaking that. STEPHEN ALEXANDER: Part of what IMPA’s role and the IMPA ACT in this is to provide additional training, consultancy and resources. Question 11: How can you prove to suppliers that are you doing what you say? HENRIK STEFFENSEN: They will be pre-qualified to receive our enquiries and get the chance to quote. Further I think that there is a very important development or process for every supplier to have this close dialogue with the owner so they know that they are going in the right way to get our business. It’s important to say also that we do not expect any supplier to be able to comply with our supplier code of conduct from day number one. We see it as a process, what we really value is that they are willing to comply with the code of conduct and we have some milestones and we check and have dialogue every time a milestone is reached. That must be worth something for the supplier. KATHRINE GEISLER-MADSEN: We can show them that we are working with the code of conduct and that we comply. And we will not have full compliance and we are not ready for the audit, but we will be. So that is the journey where you can engage with the relationship and move in the same direction. TATIANA STOTZ: The first step that IMPA ACT member would take is implementing and making a commitment to working with responsible supply chain management and get that all important top management support for the programme; also so that purchasers can be able to have the time and resources to start the capacity and development and have the time to implement this. The second part is also for purchasers to work with the same principles that they expect their suppliers to work with and that's one of the reasons why there is an ability to have a dialogue. KATHRINE GEISLER-MADSEN: We choose our suppliers based on spend dependency and frequency. That’s important in creating the right kind of leverage. If we have a supplier we use once a year in one port they might not be that interested in what were asking of them, so we are asking the ones that are closer to us in terms of spend and how often we relate to them. The fantastic part about the IMPA ACT programme is that the suppliers we have are shared with Norden. If you have a supplier tha tisn’t interested initially but is then approached by a number of ship owners, they are able to tell the supplier that it should be on their agenda. TATIANA STOTZ: I should add that it may seem like a long time to go through all your suppliers but one of the best things about the IMPA ACT from a procurement perspective is that this is time and resources intensive in terms of engaging in that type of dialogue that is beneficial for both parties. What IMPA ACT does is tracks that dialogue so that the work of purchasers can be divided. So if Norden is talking to one supplier, there is no need for JL to do so. So from a supplier point of view, there is only point of engagement, with the same code of conduct.